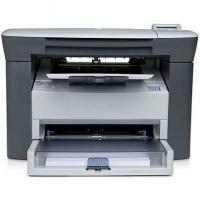 The HP LaserJet M1005 MFP is a multifunction printer that can do printing, scanning and copying. It meets the demands of a small business or home office. This is a monochrome printer and the HP Laserjet M1005 MFP toner cartridges are only capable of producing up to 1,000 pages only. The HP LaserJet M1005 MFP can easily produce at the rate of 14 ppm with a sharp resolution of up to 600 x 600 dpi. The flatbed scanner can scan with an optical resolution of up to 1,200 dpi whereas copies can be produced at a rate of 99 documents per session and resizing can be done starting from 25 to 400 per cent at the maximum. This is a compact and lightweight printer with a weight of 8.5 kg and measurement of 43.7 x 36.3 x 30.8 cm. It comes with a 150 sheet input tray and a 100 sheet face-down tray to catch completed documents. It is created to have a yield of 2,000 pages at a five per cent coverage rate. The HP LaserJet M1005 MFP can do print, scan and copy and meets the demands of a small business or home office. With good printing speed, it can print on envelopes, transparencies, cards, and postcards as well as plain paper. Duplex printing reduces paper costs by reducing paper consumption and wastage. Although this printer lacks a fax machine and HP Laserjet M1005 MFP toner cartridges is only capable of producing up to 1,000 pages but is a great choice for users. Q. How many pages will HP Laserjet M1005 MFP toner cartridges can print? A. The ink used in printing a text document is much lower than printing a photo. Ink consumed depends on what is being printed. HP Laserjet M1005 MFP toner cartridges can print around 3000 pages. Q. What is the maximum printing resolution that HP Laserjet M1005 MFP printers are capable of printing? A. HP Laserjet M1005 MFP printers can print up to high print resolutions of 600 x 600 optimised dpi for all type of printouts. A. We aim at providing good quality products for our customers, but you might receive the failures in the cartridges occasionally whether you go for new or compatible ones. That's why we offer a guarantee for our cartridges. If any failure is found in cartridges, we'll provide you with a replacement or a refund once the item has been returned to us within 30 days of delivery and tested. Q. What will be the shipping cost for me if I order the ink cartridges from this site? A. All our orders include some shipping charges that start at €1.99 inc. VAT. The delivery charge of the product goes higher according to its weight. Q. Do you offer any money back guarantee for the products purchased from the site? Q. I have recently purchased HP Laserjet M1005 MFP toner cartridges from your site but unable to install them. What should I do now? A. For installation process, you can refer to the online instruction manual. You can ask for help on 019610106 or can even contact us by email at info@printerinkcartridges.ie. Q. Does this HP Laserjet M1005 MFP printer support duplex printing? A. Yes, Duplex printing is supported by HP Laserjet M1005 MFP printer which reduces the cost per paper by reducing its paper consumption and wastage. Q. Do you supply compatible or original HP Laserjet M1005 MFP toner cartridges? How can I differentiate between these two? A. We sell both the original as well as compatible cartridges above on this site. You can differentiate between the original and compatible by looking at the manufacturer logo under the image of each product. The original will be shown in the original HP packaging and the compatible HP Laserjet M1005 MFP toner cartridges will be labeled as ‘Premium compatible HP Toner Cartridges’ with the information about the product. Q. I have ordered the wrong cartridges for my HP Laserjet M1005 MFP printer. I need to return them back. What should I do to return the non-faulty items? A. We are here to help you out with the returns for any wrong purchase. Please return an item in its original and undamaged packaging with all of its components within 7 days of cancellation. If an item is returned undamaged in its original packaging and is fit for resale, then, we will offer you a refund in accordance with our refund policy and you can place your order for the new HP Laserjet M1005 MFP toner cartridges that are compatible with your printer. If you do not return the item within 7 days of cancellation of the product, we will make a charge in respect of the cost of recovering the item. Q. What payment options are available if I want to order the HP Laserjet M1005 MFP toner cartridges from this site? A. We are focused on providing customer satisfaction and thus we came up with various payment options like Laser Card, American Express, MasterCard or Visa credit card, Maestro, Switch, Solo or Delta debit card. When you purchase any item above on this site the payment will be hosted by Sage Payments to ensure maximum security of your credit/debit card details.